An important point to address when considering drug prevention efforts is the potential for addiction. Drawing on his experience of working in drug treatment, Jim shares that most who have developed a drug or alcohol addictions would give anything to have been able to do things differently if it meant the addiction could have been prevented. A powerful exercise is used to provide a unique perspective of how difficult it is for someone to give up drugs after they have become addicted. a. Q: "What causes addiction?" A: "Using drugs causes addiction!" b. The neuroscience of addiction reveals addiction to be a chronic condition that occurs as a result of lifestyle choices, i.e. using drugs. 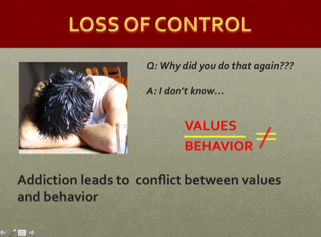 c. Addiction leads to a conflict between one's values and behaviors.